This delicious dish is full of comfort-food goodness... Just like something Mom would make, and completely guilt-free! Bring a skillet sprayed with nonstick spray to medium-high heat. Cook and stir mushrooms and onion until softened and lightly browned, about 6 minutes. Transfer cooked veggies to a medium bowl, and blot away excess moisture. Add onion powder, garlic powder, and cheese wedges, breaking the wedges into pieces as you add them. Stir until cheese has melted and coated the veggies. Season chicken cutlets with salt and pepper. Evenly divide veggie mixture between the centers of the cutlets. Roll up each cutlet over the mixture. If needed, secure with toothpicks. Place in the baking pan. Remove foil and bake until chicken is cooked through, about 15 minutes. Eat up! Like fajitas, but not into carby tortillas? These chicken rollups are for you! Serve with salsa and sour cream. Eat up! Look! 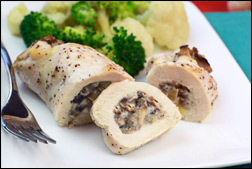 It's our very first stuffed chicken recipe -- the oh-so-simple Stuffed Chick Cordon Bleu! 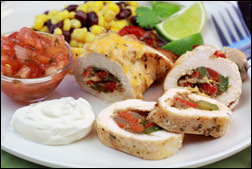 Click here for THREE stuffed-chicken recipes: Jalapeño Popper Chicken, Brocco-ful Cheesy Stuffed Chicken, and Chicken Parm Rollup... YUM! Wanna impress a date? Our Chicken Amore is perfect! No date? No worries... It's also great for a night in with a pal. Three ingredients plus a bit of seasoning... These Creamy Salsa Rollups are almost too easy. Our Nacho-rific Stuffed Chicken will satisfy your need for ooey-gooey goodness. Try it! Sharing is caring -- click "Send to a Friend" riiiiight... NOW! YAAAAAAY! It's January 24th, a.k.a. National Peanut Butter Day! Click here to check out the PB-rific recipes we developed for our pals and partners over at Cheerios!